Hotel's I-95 Location Near Shopping and Dining Whether you're coming to Lumberton for business or traveling on I-95, you'll find a comfortable stay at the Holiday InnandAcirc;andreg; hotel in Lumberton, NC. 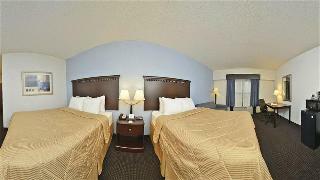 Our hotel's location near I-95 businesses, attractions and restaurants and our spacious rooms ensure a convenient stay. Situated halfway between New York and Florida, Lumberton offers our hotel's guests the perfect spot to stretch their legs by shopping at Lumber River Shopping or touring historic downtown Lumberton. This hotel's younger guests enjoy the interactive exhibits at Exploration Station Museum, while everyone can enjoy an adventure along the 115 miles of natural and scenic waters in Lumber River State Park. We offer some of the best business amenities among hotels in the I-95 corridor, starting with our four meeting rooms that include a ballroom for up to 250 guests. Our A/V equipment and Business Center services ensure you have a successful meeting! We're also convenient to Southeastern Regional Medical Center, Progress Energy, The Robesonian, UNC - Pembroke and other top employers in Lumberton. Our hotel's amenities take care of your needs, from free high-speed, wired and wireless Internet access to an on site and off site Fitness Center. Kids eat free at our on-site restaurant, Denny's, while adults can unwind in our Coca Bay Lounge. You'll quickly see why folks prefer the Lumberton Holiday InnandAcirc;andreg; hotel while traveling I-95. Situated in North Carolina, this hotel is the perfect choice for business and leisure travellers. The hotel is situated close to a variety of shopping and entertainment venues, the Robeson Planetarium and Science Centre, the South-eastern North Carolina Agriculture Centre and the Robeson County Museum. The more adventurous guest can enjoy the Britt Park, Lumber River State Park and the host of opportunities for picnics, hikes and trails. Guests interested in retail will enjoy a trip to the Biggs Park Mall, where designer labels await. Guests can relax and unwind in the spacious hotel rooms, sure to induce relaxation. The array of facilities this modern hotel has to offer will not disappoint even the most discerning guest. Whether travelling for business or for pleasure, each individual guests' culinary and recreational needs and desires will be satisfied with a stay at this hotel.